White Dwarf 98 arrives like a book of secrets – and upon its forbidden pages, the Gaunt Summoner of Tzeentch! Who is this willowy wizard of wicked power? 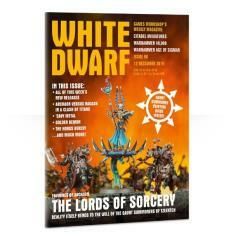 As ever, White Dwarf provides all manner of forbidden knowledge, including a full painting guide and warscroll. Elsewhere, there is a brutal confrontation between no lesser beings than the Everchosen and the Supreme Lord of the Undead, ’Eavy Metal (creatures of near god-like power themselves, of course), a look at one of the very finest entries from Golden Demon: Tanks, and the concluding part of the massive, all-encompassing guide to the Black Library’s Horus Heresy series.